A few minutes before seven on a cold Monday night in January, a line forms up the stairs leading to the basement of a bar in Manhattan’s East Village. Inside, the lights are dimmed, bartenders shuffle behind the bar, prepping ingredients for the drink menu, which includes craft cocktails, sparkling rosé and an IPA on tap. But unlike every other bar on the block, patrons of this watering hole could drink all night without getting so much as a buzz: Nothing on the menu contains a drop of alcohol. When Lorelei Bandrovschi first started sharing her idea for Listen Bar, a pop-up that offers the social atmosphere of a hip lounge with a 100% virgin drink list—crafted by talented bartenders including Jack McGarry of Dead Rabbit, Pamela Wiznitzer of Seamstress, and Aaron Polsky of Harvard & Stone and complete with a guide for dietary restrictions—she found people had some strong opinions. 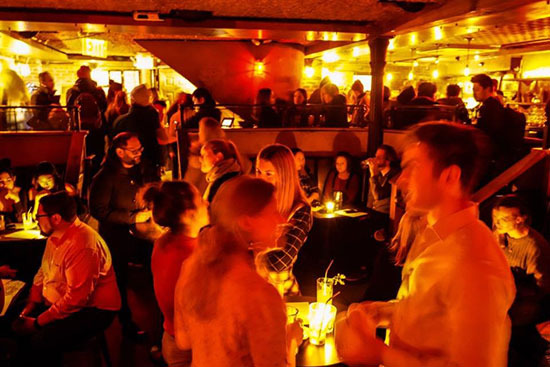 After a five-day pop-up in Williamsburg last year, Listen Bar is hosting booze-free nights every Monday during the phenomenon known as Dry January—when drinkers who indulged freely over the holiday season attempt to reset by taking a month off the sauce. But given the spot’s popularity over the past few weeks, Brandrovschi thinks Listen Bar has a life beyond January 31st, so she’s started a crowdfunding campaign that she hopes will land her concept a permanent home. She’s not the only one to see the potential offering people the trappings of the drinking life—without that pesky alcohol. The hospitality industry at large is catching on; the number of “mocktail” menu items increased by 13% from the first half of 2016 to the same period in 2017, according to Technomic, a market research firm that covers restaurants. And as more spirit and beer companies have jumped on the booze-free bandwagon, those bartenders and mixologists have had many more options to work with. Of course, for companies, it’s also about the bottom line. In the beer industry, the move into alcohol free has been fueled by the need to find new sources of revenue: the amount of alcohol consumed in the U.S. has dropped over the last two years—due, in large part, to dwindling beer sales. Heineken launched its alcohol-free beer, Heineken 0.0, in the U.S, this year. Anheuser Busch InBev, maker of Budweiser, announced another alcohol-free beer this month. And the company plans to grow those products to 20% of the company’s portfolio by 2025 and even appointed a chief non-alcoholic beverage officer last year. Some craft breweries, like Athletic Brewing, are focused solely on alcohol-free beers. Bandrovschi, who serves Athletic’s IPA at Listen Bar, says the brew is so good that patrons at a recent pop-up drank three rounds before realizing it was non-alcoholic. Alcohol-free spirits are also finding a growing customer base. Curious Elixirs crowdfunded through Kickstarter in 2016 to get their booze-free craft cocktails to consumers. Since then, founder John Wiseman says, demand “is only speeding up” and the company has seen sales grow nearly 10X year-over-year. While the U.S. market is still warming to non-alcoholic offerings, the shift in preferences is farther along in Europe, particularly in the U.K. where 4.2 million people planned to participate in Dry January this year, according to a YouGov poll. Ben Branson, founder of the nonalcoholic spirit brand Seedlip, launched his product in the U.K. in 2015. Billed as “the world’s first distilled non-alcoholic spirits brand,” Seedlip is now part of a growing category. “In the last nine months we’ve seen about 40 new products launch in this space,” says Branson. He expects the nonalcoholic offerings will continue to grow and innovate, noting the “incredible energy” he’s seeing now within booze-free beverages. Diageo acquired a minority stake in Seedlip in 2016, the first investment in a nonalcoholic product for the world’s largest spirit company and maker of Smirnoff, Johnnie Walker, and Don Julio among others. Since then the U.K. has seen alcohol free ‘alt-gin’ Ceder land a distribution and marketing agreement with Pernod Ricard, home of brands like Absolut and Jameson. Last year the Stryyk brand brought booze-free rum, gin, and vodka to consumers in the U.K. and Caleño, a new alcohol free spirit, launched there earlier this month. For the Seedlip founder, increased participation in Dry January and it’s counterparts like Sober October, Dry July in Australia, and Tournée Minérale (Dry February) in Belgium are an indication of a major shift in the way people think about their relationship to alcohol. Young people today have more information than the generations before them about how what they consume affects their bodies. They’re drinking less and seeking out alternatives.